The pervasive conflicts that have gripped the Middle East over recent years — from political turmoil in the wake of the Arab Spring to the rise of Islamic State militants — have taken a serious toll on the outlook of people across the region, according to a Pew Research survey conducted this year. While most emerging nations in our survey are satisfied with life today and optimistic about the future, those in the Middle East stand out for being unhappy with their countries, their economies and their lives, and wary about what the future holds for themselves and their children. A median of roughly three-quarters of the Middle Eastern countries surveyed say their countries are moving in the wrong direction and their economies are doing poorly. This level of dissatisfaction is on par with Europeans’, who have had a gloomy outlook on national conditions since the onset of the economic crisis. But it is more negative than attitudes in either Asia or Africa, especially when it comes to the economy. Middle Easterners’ unhappiness also carries over into their personal lives. When asked where they stand on the Cantril “ladder of life,” where 10 represents the best possible life and 0 represents the worst possible life, a median of 15% give their life a rating of three or lower. This is nearly double, or more, the percentages who say the same in Europe, Asia, Latin America and the U.S. The only place more dissatisfied is sub-Saharan Africa. However, this greater unhappiness in Africa is consistent with the general finding that poorer countries are less satisfied with their lives. On average, people in Uganda, Tanzania, Kenya and Ghana have much lower incomes than people in Jordan, Egypt or Tunisia. And it is not just the present that is demoralizing: Middle Easterners are concerned about the future with a median of 33% saying their economy will worsen in the next 12 months. This includes more than four-in-ten who say things will get worse in Lebanon (46%) and the Palestinian territories (44%). In comparison, roughly a quarter or fewer in Asia, Latin America, Africa and even Europe express such pessimism. Looking further down the road, people in the Middle East are the most likely among those surveyed to say their life is going to get worse over the next five years. They are also uncertain about their children’s financial future – 35% say their kids will be better off when they grow up but 41% say they will be worse off. 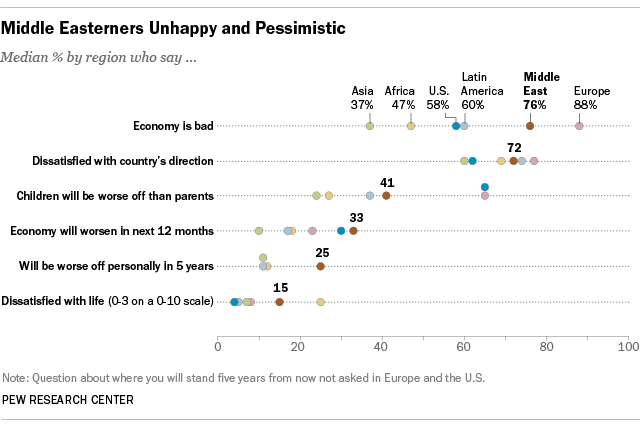 Only Europeans and Americans are more pessimistic about the next generation.